A Homeschooling Essential—How Should We Then Live? There are many good books and a few great ones but only a handful that should be read by all Christian homeschooling parents and teens. How Should We Then Live? by Francis Schaeffer is one of them. 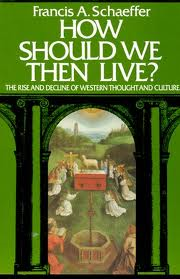 Beginning with the Romans, Schaeffer traces the history of Western thought right up to the present. Yes, even though he passed away almost thirty years ago, his book describes events happening today. Most likely he was able to tell the future so accurately because he understood the past so well—not merely the facts but especially the principalities and powers behind them (Ephesians 6:12). So, starting with the Romans as mentioned earlier, Schaeffer traces those three lines, through the Middle Ages, the Renaissance and Reformation, the ‘Enlightenment’, the rise of modern science, and the breakdown of all that to modern thought, modern worship, a powerful elite, and our easily-manipulated society. He discusses philosophy, art, science, theology, and literature, arriving at a chilling analysis of our popular culture and modern world. In the end, only Christianity can give hope for the future of this world. Of course we know what that means for individuals, but often we don’t really understand how it applies to society. By showing how one idea leads to another, Schaeffer gives us a new understanding of the problem and points to the details of a solution. In response we, as Christians, must not adopt the deadly and unbiblical split between reason and faith that characterizes our society but must understand that God’s Word is true for all aspects of life. We must understand what this means and act upon it to influence society in all its aspects. That is part of what it means to love the Lord our God with all our hearts, souls, minds, and strength. If you wish your teens to understand the background ideas that influence us today as well as what to do about them, do include this book in your high school curriculum. It will help them understand some of the ideas they will encounter from professors, coworkers, the media, and our general culture. It will equip them to stand firm and defend their convictions and will also give them a beginning understanding of how to make a difference. I’m thankful that my older children have had a chance to read this book. This is also vital reading for parents. I have read How Should We Then Live? At least three times, and each time I read more slowly and thoroughly. It’s that kind of book. As you grow and learn about life, you become more able to understand the book, which helps you understand the world better, and so on, in a very positive spiral. And each time you read it, Schaeffer’s call to action will resonate with you in a different way. So do consider, as you finish the book: what is God calling you to do right now? Obviously, if you are a homeschooler, it will have implications for your homeschool, especially for how you teach your teens. It may also have implications for other aspects of your life and service, depending on your current commitments. But be careful. Don’t neglect your daily calling to be a wife and mother at home for something out in the world; there is a time and a season for everything, and right now loving and educating your children is the most important and influential task you have. How Should We Then Live? is part of our homeschool this year, and I’m looking forward to rereading it. We will use Veritas Press’s Omnibus as a guide as we have done before. Another book of similar importance, Total Truth, is also highly recommended; we aim to study it next. This post is an update of my 2013 review of How Should We Then Live? Posted in: Homeschool Tips, Omnibus, Planning, Reviews, Reviews: Curriculum, Reviews: Nonfiction, Reviews: Omnibus, Reviews: Reformed.